Tonight I was tasked with making a low carb dinner since Jen is going in for the standard pregnancy glucose test tomorrow to see if she is developing gestational diabetes. It's actually called the "Glucose Challenge" to make it sound like it's just a fun game. I was up for this challenge. After racing home and firing up the grill I set out to make something that would be sure not to spike Jen's glucose levels prior to her test tomorrow morning. 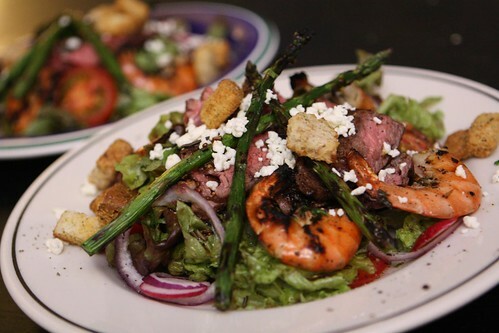 I grilled up some skirt steak, shrimp, and asparagus and made this salad with red leaf lettuce, sliced radish, red onion, tomato, feta cheese and chopped chives, rosemary, and parsley. I topped it all with some of Jen's mysteriously jarred salad dressing that I found in the fridge. She was a little annoyed that I hadn't read her mind and brought home blue cheese for this salad. She claims she emailed me to ask me to bring some home but I think she is mistaken. At any rate, the feta worked fine as a proxy. The beer I selected was probably not the best pick to accompany such a deal. 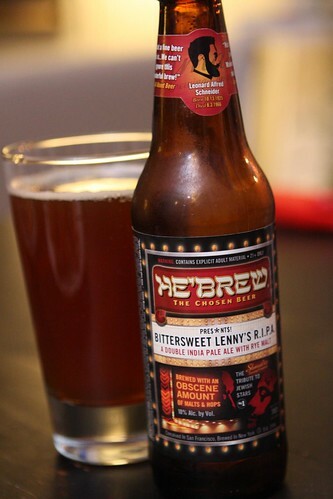 It was this He'Brew Bittersweet Lenny's R.I.P.A. from Shmaltz Brewing Company. I didn't realize until drinking it that this was a beer tribute to Lenny Bruce. It was exceptionally malty and fairly hoppy. Just like Bruce himself! 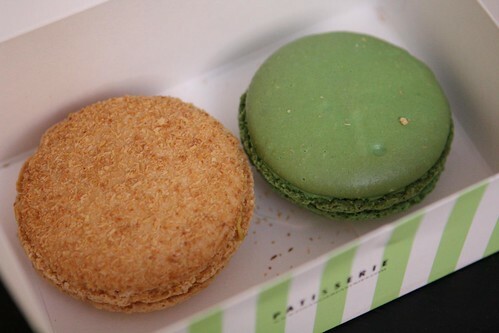 Jen surprised me by bringing home these marcarons from Financier Patisserie. We had a coconut passionfruit and a pistachio and both were quite good. I could have used two or three more but I imagine we would have needed another type of financier to make this possible. So much for low carb. Our Roku box came in today and I was excited to get it up and running so that we could watch the NHL playoffs. The signup process for the NHL GameCenter app was so stupid and convoluted that this sadly did not happen. Hopefully we will get it up and running at some point so that we can watch some hockey. It looks like the absurd rules of local blackouts may work against us but I am hopeful that soon we will be able to watch the Flyers and Penguins pretend that they are interested in the game at hand rather than at beating the pulp out of each other and likely affecting the rules of hockey fighting for future generations with their unrestrained savagery. Until then there is always No Reservations. Summer Preview: Now with Actual Grilling! Easter? I Hardly Know Her!